Tallahassee Mayor Andrew Gillum. a Democrat, used low-cost texts to help win his party’s gubernatorial primary in Florida. Tallahassee Mayor Andrew Gillum didn’t seem to have a prayer of winning last week’s Democratic gubernatorial primary in Florida. Gillum’s opponents spent nearly 15 times as much as he did, and late polls had him trailing badly. But Gillum spent much of his campaign war chest on the hottest outreach tool of the season: He reached out to voters with inexpensive text messages, instead of costly TV ads or annoying phone calls. And he relied on polling data gathered on the Internet instead of with landline telephones. In the end, Gillum scored the biggest upset of the primary season, winning with 34 percent of the vote. 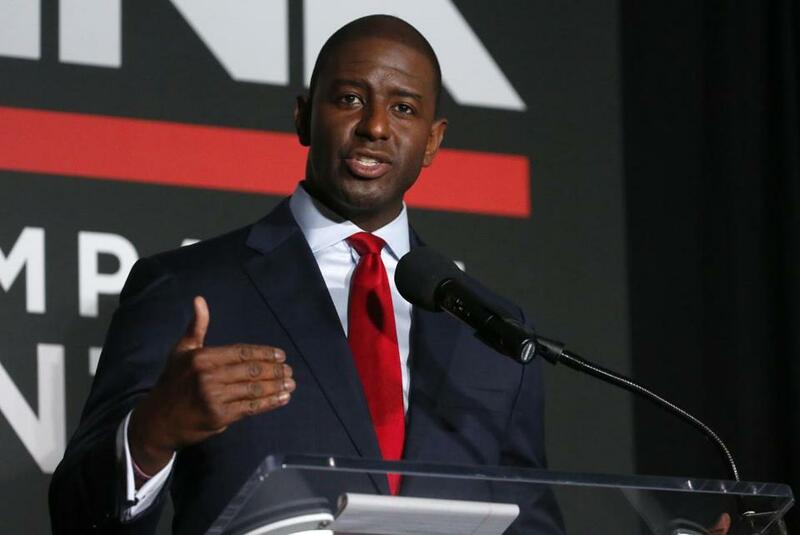 His polling company, Change Research, had predicted that Gillum would win with 33 percent of the vote, making it the only pollster to predict his victory. Gillum’s stunning victory hints at the shape of the digital battlefield circa 2018, as citizens vote in Massachusetts’ own primary election on Tuesday and candidates here and across the country prepare for the sprint to November’s midterms. Digital technologies such as group texting and online polling have been refined and sharpened to compensate for the shortcomings of such traditional methods as TV ads and phone polls. The new tools are often cheaper to use, leveling the playing field in an election year that features many younger and first-time candidates who are challenging establishment figures. “For me, it’s about using digital technology and data in all parts of campaigning, and not just digital ads,” said Jessica Alter, cofounder of Tech for Campaigns, a volunteer network of workers at leading technology firms who apply their skills to the campaigns of liberal candidates. Gillum’s most potent weapon, peer-to-peer texting, proved its worth in the upstart Bernie Sanders presidential campaign. Through it, volunteers send text messages to thousands of potential voters. But unlike bulk e-mail messages, these texts are sent from one individual to another. This avoids breaking a federal law that restricts robotexting. But it also lets voters reply to a human being who can answer questions or invite the voter to an event. “It’s using texting the way we use it with our family members and friends, which is to have real conversations,” said Roddy Lindsay chief executive of Hustle, a peer-to-peer service exclusively serving progressive candidates. The Gillum campaign didn’t spend much on TV ads, but it used Hustle to crank out 1.5 million text messages. Hustle said it is working with the Massachusetts Democratic Party and directly with more than a dozen campaigns, including those of Elizabeth Warren and Ayanna Pressley. In Massachusetts, voters reported receiving texts from a volunteer for Rachael Rollins, a candidate for Suffolk district attorney, and from a volunteer for Pressley, a candidate for Congress, among other candidates. The texts addressed the voters by their first name and urged them to vote for the candidate. Republican candidates are also getting in on this game. Dismayed with the GOP’s relative lack of technical savvy, Thomas Peters launched the political startup uCampaign in 2015. Peters believes his company’s peer-to-peer texting service, RumbleUp played a crucial role in the recent Minnesota Republican gubernatorial primary. In that state, Jeff Johnson, a little-known county commissioner, upset former governor Tim Pawlenty. Democratic candidates also are taking advantage of a new kind of polling — Internet-based, fast and cheap. Gillum’s polling firm, Change Research, uses the results of Internet questionnaires to assess public opinion, rather than relying on phone calls. But Change Research isn’t infallible. Days before December’s special election for US senator from Alabama, it put the controversial GOP candidate Roy Moore six points ahead of Democrat Doug Jones. Jones edged out Moore to win the race. Still, the Gillum results suggest that Greenfield, a former data scientist at PayPal and Linkedin, is on to something. Greenfield said that using the Internet instead of landlines allows Change Research to get more responses to its surveys, and to get those responses quicker. “Larger sample sizes yield more accurate results,” he said. Of course, candidates from both major parties are exploiting social media, but the rules have changed since 2016. Facebook, Twitter, and Google now require political advertisers to provide proof of their identity and location. It’s a way to prevent election meddling by foreign governments, such as Russia’s. “It does take a little bit more work than previously,” said Eric Wilson, a GOP digital strategist and publisher of the newsletter Learn Test Optimize, but he added that the new requirements aren’t onerous and have to be implemented only once. A more significant shift came in January, when Facebook announced that users would see more messages posted by friends and family members, and fewer from businesses and organizations, including the news media. Before the change, a Facebook page devoted to a candidate or issue allowed campaigns to reach thousands of users free of charge. Now this tactic is less effective because fewer Facebook users will be directed to a candidate- or issue-related page. But Facebook is as willing as ever to show paid advertisements, so campaigns this year are spending more money on them. Expect these Facebook ads to be aggressive, even outrageous, said Mike Conlow, head of technology consulting at Blue State Digital, a New York firm that works with Democratic candidates. That makes it more likely they’ll go viral, as thousands of viewers share them with friends and foes. In the end, the value of these technologies and tactics will be determined at the ballot box. But Nicco Mele, director of Harvard University’s Shorenstein Center on Media, Politics and Public Policy, said it’s hard to attribute victory to any given gimmick. “I’m profoundly undecided,” he said.